The Eurasian Jays are among the most intelligent birds studied thus far by biologists, belong to the corvids, a group of birds that also includes crows. The latter are especially gifted, as they’ve been observed making use of tools, associate faces with behavior and even recognize when a fellow crow has died. Quite crafty fellows. Ravens, which also belong to the same family of birds, use gestures to communicate with their peers. 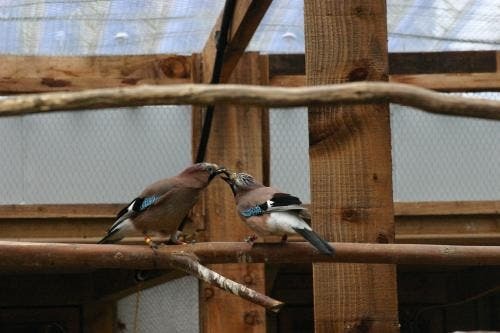 Back to the jays, though, since this time they’re at the center of attention after researchers at Cambridge University found that males would often feed their partners based on what the females’ desires. This suggests that jays are capable of recognizing and understanding the internal life and psychological states of others – something scientists call “state-attribution”. A bit of background on the jays feeding behavior, first. You would think anything remotely looking like food would do for the jays, but these monogamous birds are quite picky. It’s well known that jays often stockpile food for later use, not only out of a sense of security for tomorrow’s meal, but also for variety. Bet you didn’t know that. The researchers tested pairs of jays to see how well the male partner could infer the female’s intentions. Thus, the pairs were separated; the female was introduced in a compartment where it was fed with one particular larvae, either wax moth or mealworm – both considered delicacies in the jay world. In the meantime the male would watch from an adjacent compartment through a transparent window. The pairs were then reintroduced. They found that when the male was given the chance to present food to his mate, he would offer the female a kind of food she previously didn’t have access to. So for instance, if the female was initially fed one type of larva, the male would choose to present the other type of larva the female hadn’t ate yet. Something most welcomed by the female, as the researchers note. Multiple types of food were used, but the behavior was the same – the male would diversify the female’s food, known it would be to her liking. Visual access was also varied, allowing the researchers to prove that the males needed to see what the females were eating in order to present the best mix. This rules out the possibility that the female might signal the male with some sort of sign to bring a desired kind of food. “Our results raise the possibility that these birds may be capable of ascribing desire to their mates – acknowledging an ‘internal life’ in others like that of their own,” said Ljerka Ostojic, who led the research. “Ascribing internal states to other individuals requires the basic understanding that others are distinct from the self and others’ internal states are independent from, and differ from, one’s own. The implications of this are quite extraordinary, since it puts the jays in a behavioral and psychological range previously thought to be reserved to primates only – an ability to infer your peer’s minds. Scientists refer to this as the “theory of mind”, which I recommend you look up a bit. Findings were reported in the journal PNAS.